KOKOMO, Ind. — A grant from the Indiana University Women's Philanthropy Council (WPC) allows more students to participate in an IU Kokomo overseas travel program. 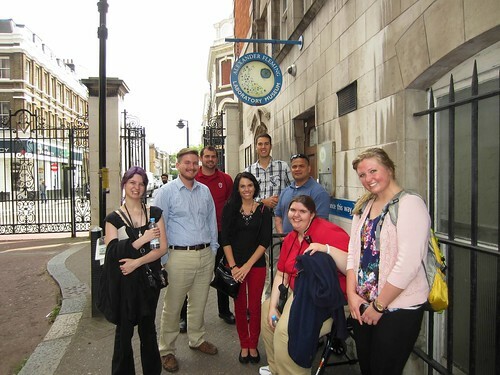 Students spend time in the United Kingdom during the Innovation Symposium, 2014. The Innovation Symposium's grant will cover travel expenses for eight to 10 students to spend three weeks in England and Scotland in May and June 2015. This is no tourist trip — they visit museums and ecological sites, learning about philanthropy, the environment, and technology, and each one develops a program to solve a local problem. "Because of this tremendous gift, the 2015 Innovation Symposium members should be able to pay less than any previous group has," said Karla Stouse, program leader. "This will allow all students who are nominated to seriously consider applying, because they won't be as concerned about the money." Cost for the 2014 trip was $3,500 per student, a sum out of reach for many students, according to Leann Cook, one of the participants. Even many of those selected to go struggled to pay for the experience, she said. "Knowing there is money to help pay your expenses means you can say yes earlier, rather than trying to figure out how you're going to pay for it," she said. "That means reservations can be made earlier, when prices are lower, which brings down the total cost of the trip." Stouse said travel costs for the program have increased substantially since 2008. Hotel rooms that cost $100 per night when the program began now cost $160 or more per night, and the cost of airfare has nearly doubled. She was grateful to past Innovation Symposium participants for their help in securing the grant. She was traveling with the 2014 group when presentations were made to the WPC, and previous participants Ann Andrezejewski, Laura Brown, Justin Clark, and Kristianna Upchurch made a grant presentation to the WPC council on her behalf. "The program's success is due to their excellent work to develop and implement their projects, plus their ongoing commitment to the Innovation Symposium," she said. "About 80 percent of previous participants remain actively involved in some capacity, which gains us a lot of positive attention. I am grateful they continue to offer their time and talents to support the program." IU Kokomo's grant was one of nine approved by the WPC, for a total of $108,000 in funding. There were 37 grant applications, from eight IU campuses. The nine selected programs received funding ranging from $7,000 to $17,000. The council has awarded more than $325,000 in grant funding since it began in 2012. Kay Booth, WPC chairwoman and a founding member of the council, said its mission is to strengthen IU and the communities in which members live. "We are thrilled to support these unique initiatives that address critical needs in health, diversity, and scholarship in local, national, and international arenas," she said. "Many lives will be touched and we firmly believe that the world will be a better place as a direct result of these projects."